Working with a Landscape Architect/Builder from Queensland, Botanical Traditions provided the planting plan & on-going horticultural works along with assisting with the design development for this large residential project. The residence had significant Heritage so plans had to be approved by Heritage Victoria. This residential design featured a curved deck reaching into the back of the garden which created the feeling of being in the tree tops. Eucalyptus trees were been planted in the deck to strengthen the feeling of being in a natural setting. 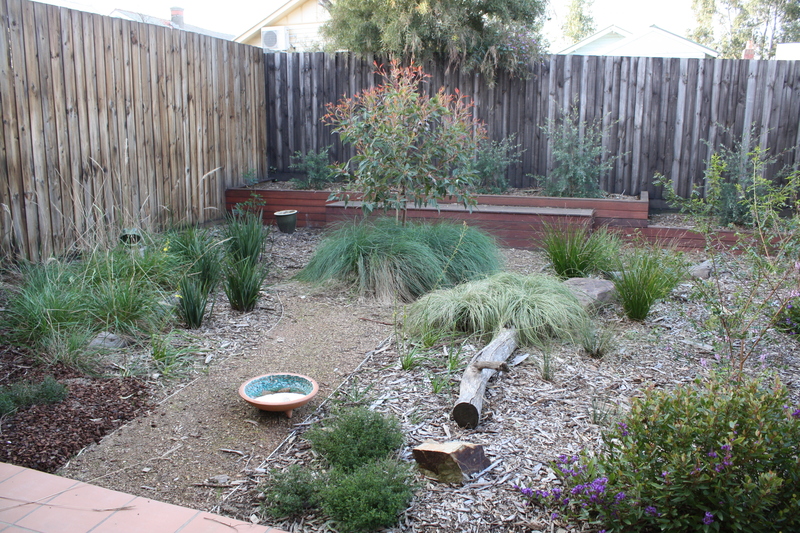 A mix of native and indigenous plants were used to create a waterwise garden, requiring very little additional irrigation once established. To aid in the initial establishment, a below ground irrigation system was installed which uses captured rainwater. The project was completed in 2010 and received a highly commended in the National AILDM Awards 2011. 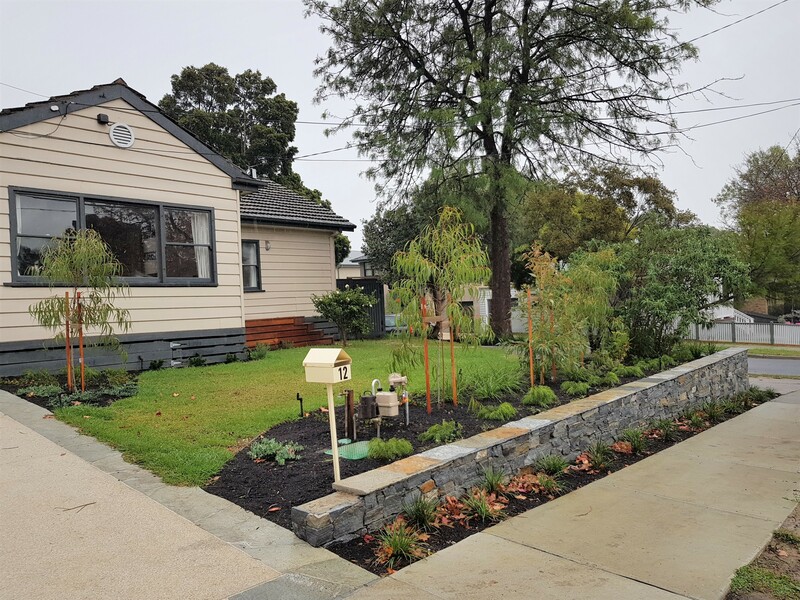 The project was completed in 2010 and was a finalist in the Boroondara Sustainability Award. This project involved a warehouse conversion in a small backyard located on the western side of Melbourne. The young couple wanted a simple and cost effective design which would provide them with a lawn, paved area and screening of the surrounding properties. The client gave us a very clear brief. Create a garden which was aesthetically pleasing, contained a mix of natives and exotics and gave them large paved areas for their kids to play on. The soil conditions were very difficult and compacted so significant remediation works were carried out. We also installed an automatic grey water irrigation system. 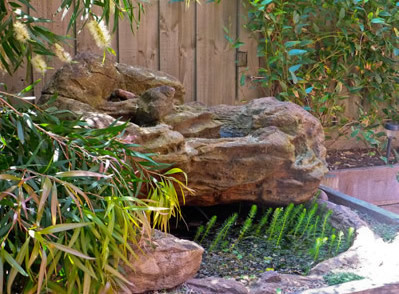 This design was an exploration of contemporary landscape design and was a response to the clients brief for something individual, waterwise and unique. The clients needed something dramatic visually as the garden was seen from most areas of the house. The design featured an interesting paved area, custom designed water feature, stainless steel planters and timber screens. This project involved creating a native style planting design for the front and back yards of this residential property. 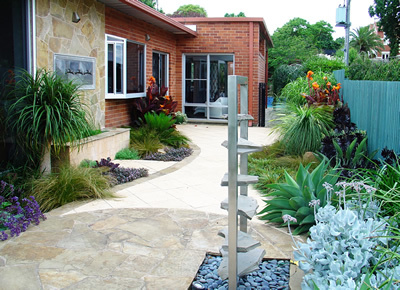 This project involved creating a planting design for a modern contemporary home and renovating the front entrance water feature. 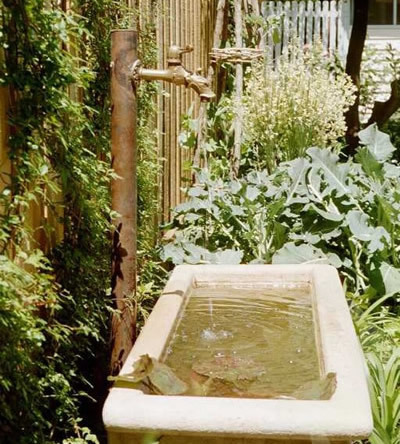 This project involved a custom made water feature with a herb garden to create a rustic formal look.